Net freedom fighter Lawrence Lessig has urged the UK Government to ensure that laws designed to prevent digital piracy do not trample over the right of fair use. On his recent visit to the UK, the Stanford University law professor held a private meeting with government media policy advisers at Number 10 Downing Street. The meeting, organised by Damian Tambini, Director of the Program for Comparative Media Law and Policy (PCMLP) at Oxford University, was attended by Ed Richards, the prime minister's media policy adviser and the man behind the recent Communications Bill. At the meeting professor Prof Lessig spoke about ways in which the UK Government can ensure that new laws protecting digital information from piracy do not result in the erosion of the public's right to share and use intellectual property. His views may influence the government's approach to proposals to change the Patent Act to implement the European Union Copyright Directive. These were so widely criticised by copyright campaigners that the original timetable for implementation was put back by three months. Prof Lessig's intervention at a senior level may result in a rethink of plans to make it illegal to use a multi-region DVD player or copy DVDs for personal use. He was in the UK to speak at the Politics of Code conference at Oxford University, jointly organised by the PCMLP and the Oxford Internet Institute. At the event he strongly criticised large media corporations for abusing copyright law in order to exert complete control over all aspects of copyright work. He explained how a reader of the Adobe eBook version of George Eliot's Middlemarch is only allowed to cut and paste 10 sections of the book every 10 days, even though the work is out of copyright. By contrast, no cutting and pasting is allowed of the eBook version of his latest book, The Future of Ideas, even though both UK and US copyright law would allow quoting from the book in a review or academic study. The problem arises because the technology used to protect the material from copying - in this case Adobe's program code - is itself protected by law. In the United States the Digital Millennium Copyright Act makes it an offence to break the protection even if the purpose is to do something allowed by copyright law. Soon we may have a similar law here under the European Union Copyright Directive. Prof Lessig pointed out that this means that unregulated use of copyright material becomes impossible, "entering the jurisdiction of the law because of an accident of design". He believes that this matters because "it affects creativity. [Creativity] has never been more controlled in our history - ever". The result, he claims, is that the scope for creative use of other people's work becomes more and more limited, and the end result is a reduction in innovation, both artistic and commercial. Composers can no longer take inspiration from each other, but neither can programmers or industrial entrepreneurs. This, he argues, leaves us all poorer. Little is done to counter this because, as he pointed out "where I come from the presumption is that what is good for AOL is good for America", and as a result only corporate interests are reflected in government policy. 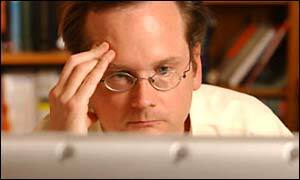 Prof Lessig is trying to do something about this other than just offer advice to the prime minister's advisers. Just last month he represented US online publisher Eric Eldred in a case before the US Supreme Court seeking to overturn a US law which extended the term of copyright by 20 years and took many works out of the public domain. That case was lost, but Prof Lessig is determined to fight on to re-establish the principle that copyright is a bargain between creators, rights holders and the people, not an absolute property right as media giants seem to think. A related issue is computers which are being altered to support this model of intellectual property. And chip-maker Intel's plans to build copyright control measures into new generations of processors also came under attack at the conference. In another conference session on digital rights management, systems which control the distribution and use of copyright material when it is sent over a network or played on digital devices, Intel's plans were outlined by Jens-Henrik Jeppesen from the Intel's Government Affairs team. His argument that Intel was against the destruction of the public domain and was only providing technology for "keeping honest people honest" provoked one delegate to claim that "the level of control you are proposing is a dictator's dream", accusing Intel of planning to "take us into a digital dark ages". Intel's position received little support from Ian Brown of the Foundation for Information Policy Research, who listed the many problems with attempts to control digital material solely through technology. He pointed to the "break once, play anywhere" flaw - if you have a system for licensing digital music or movies, then once someone has cracked it then anyone can use the cracked version freely - as evidence that such systems are simply not viable. The conference ended with a stirring call to action from Professor Lessig. He said that his pessimism about the prospects of fighting for copyright had been overcome by the quality of argument and passion for creative freedom he had heard during the day. Who decides who's a digital criminal?